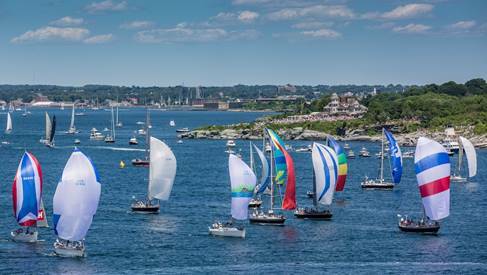 The 195 boats that submitted entries before the 2018 Newport Bermuda Race “application for entry” deadline are anchored by the usual excellent turnout of nearly 150 cruiser- and cruiser/racer-style boats sailing in the St. David’s Lighthouse and Finisterre (Cruiser) divisions. 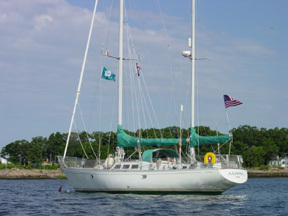 The race, which is co-organized by The Cruising Club of America and the Royal Bermuda Yacht Club, offers several other divisions for different types of boats and competitors, which truly makes this event seven races in one. Among the entries in St. David’s and Finisterre divisions, the 2016 success of youth sailors guided by adult advisors aboard High Noon (link) has led to four entries by youth teams in 2018. There will also be new divisions of Multihulls and Superyachts, which have added seven boats to the fleet, the largest of which is the 112-foot Sparkman & Stephens design, Kawil. Another key to the high entry total is the 20 boats entered in the Gibbs Hill Division, which is for high-performance racing boats that in many cases are steered and crewed professionally. Recognizing advances in offshore racing technology, the Bermuda Race Organizing Committee allowed entry this year by boats carrying water-ballasting systems and certain types of canting keels. In past years, Gibbs Hill typically has drawn 10 to 15 entries; in 2016, based on the high winds forecast in the days before the race, all of the Gibbs Hill entries elected not to compete. The introduction of a Multihull Division was three years in development, and based on the standards adopted for 2018, not every multihull will be eligible to compete. Collaborating with an experienced cadre of multihull designers and sailors, the Cruising Club of America’s safety committee developed new ocean-racing safety standards for participating multihulls and set more rigorous safety training requirements than for monohull crews. In addition, the BROC collaborated with the Offshore Racing Association to create a new VPP handicap system for multihulls (ORR-MH) that was successfully tested in the 2017 Transpac Race.